This example uses the same diagram workspace that you created in Chapter 2. You have the option to create a new diagram for this example, but instructions to do so are not provided in this example. First, you need to add the SAMPSIO.ASSOCS data source to project. 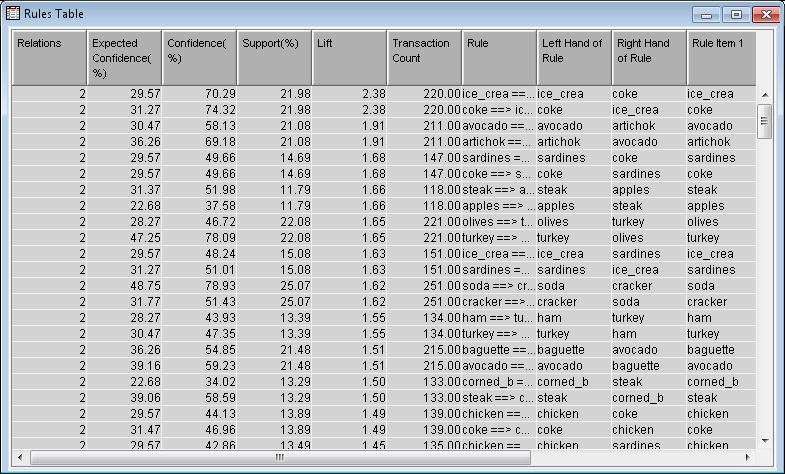 In the Data Source Wizard — Select a SAS Table and enter SAMPSIO.ASSOCS in the Table field. Click Next. In the Data Source Wizard — Metadata Advisor Options window, click Advanced. Click Next. For the variable CUSTOMER, set the Role to ID. For the variable PRODUCT, set the Role to Target. For the variable TIME, set the Role to Rejected. Note: The variable TIME identifies the sequence in which the products were purchased. In this example, all of the products were purchased at the same time, so the order relates only to the order in which they are scanned at the register. When order is taken into account, association analysis is known as sequence analysis. Sequence analysis is not demonstrated here. In the Data Source Wizard — Decision Configuration window, click Next. In the Data Source Wizard — Data Source Attributes window, set the Role of the data source to Transaction. Click Next. In the Project Panel, drag the ASSOCS data source to your diagram workspace. On the Explore tab, drag an Association node to your diagram workspace. Connect the ASSOCS data source to the Association node. To perform association discovery, the input data set must have a separate observation for each product purchased by each customer. You must assign the ID role to one variable and the Target model role to another variable when you create the data source. To perform sequence discovery, the input data set must have a separate observation for each product purchased by each customer at each visit. In addition to assignment of ID and Target roles, your input data must contain a Sequence variable. The sequence variable is used for timing comparisons. It can have any numeric value including date/time values. The time or span from observation to observation in the input data set must be on the same scale. Because you set the role of TIME to Rejected, the Association node performs an association analysis in this example. Observe the Association properties subgroup of the Association node. These properties determine how large each association can be and how association rules are formed. Set the value of the Maximum Items property to 2. This indicates that only associations between pairs of products are generated. In your diagram workspace, right-click the Association node and click Run. In the Confirmation window, click Yes. Click Results in the Run Status window. In the Results window, select View Rules Rules Table from the main menu. The Rules Table displays information about each rule that was created. This includes the confidence, support, lift, number of occurrences, and the items in the rule. To explain confidence, support, and lift, consider the rule A => B where A and B each represent one product. The support percentage for A => B is the percentage of all customers who purchased both A and B. Support is a measure of how frequently the rule occurs in the database. The confidence percentage for A => B is the percentage of all customers who purchased both A and B, divided by the number of customers who purchased A. The lift of A => B is a measure of the strength of the association. For example, if the lift is 2 for A => B, then a customer who purchased A is twice as likely than a customer chosen at random to purchase B. Sort the Rules Table by Support (%). Notice that the top two rules are heineken ==> cracker and cracker ==> heineken, both with a support of 36.56%. This indicates that 36.56% of all customers purchased beer and crackers together. The confidence for heineken ==> cracker is 61%, which indicates that 61% of customers who purchased Heineken then purchased crackers. For the rule cracker ==> heineken, the confidence is 75%. This means that 75% of the customers who purchased crackers then purchased Heineken. Lift, in the context of association rules, is the ratio of the confidence of a rule to the expected confidence of the rule. The expected confidence is calculated under the assumption that the left hand side of a rule is independent from the right hand side of the rule. Consequently, lift is a measure of association between the left hand side and right hand side of the rule. Values that are greater than one represent positive association between the left and right hand sides. Values that are equal to one represent independence. Values that are less than one represent negative association between the left and right hand sides. Sort the Rules Table by Lift. Notice that the rule ice_crea ==> coke has the greatest lift. This indicates that customers who buy ice cream are 2.38 times more likely to buy Coke than a customer chosen at random.